I can still remember the day I discovered this blog. I wanted to get better information on free jazz because I was dissatisfied with the regular magazines and so I tried it on the web. I put in “free jazz” in the search machine and after the usual Wikipedia entries there was this site. I entered it and found Stef’s frenetic review on Wacław Zimpel’s Hera, a band I have never heard of before. That was in December 2010 and as to music many things have changed in my life since then. In the meantime I have bought many CDs by Zimpel and of course I was excited when I heard that he was going to release new material with his new quartet. So expectations were high, but I was not disappointed. 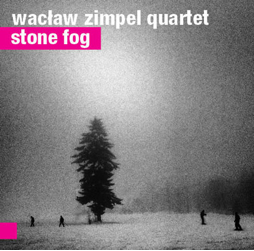 Their new album Stone Fog is bookended by two marvelous compositions based on a massive D minor chord (“Cold Blue Sky” and “Stone Fog”), both almost classic Zimpel compositions which remind of his majestic Undivided albums The Passion and Moves Between Clouds. Both pieces have a marvelous spiritual quality, you can literally feel the deep melancholia and the roots of this music (Coltrane’s way to play the blues, Jewish klezmer music). Around very delicate bass lines and sparse percussion the clarinet notes and piano modulations drip like honey into thick red wine. For his fans this could go on for hours. It is the clash of these classical influences and modern jazz (e.g. Jimmy Giuffre’s classic trio) which make this music so exciting. Part of the idea of this lineup was to achieve a very wide spectrum of stylistics, Zimpel also said, which can be heard in the central pieces “Hundreds of Wings Steel the Sun” and “One Side Of My Face Is Colder Than The Other” - the first one built around massive piano drones while bass and drums fall apart and the clarinet squirms with pain, the second one a spooky soundtrack-like track full of fragmented chords, lost strummed bass notes and jingling little bells which the band then transforms into a beautiful lament. This is another wonderful album by outstanding musicians, and although Zimpel has been constantly supported by this blog, he is still underrated. The world is cruel and unfair. Can hardly wait to get my hands on this CD. Thank you for the review!